It’s hard to believe the New Year is in full swing and January is almost over. It’s time for a check-in. How are you doing with your New Year’s resolutions in 2019? Still going strong? Or, have you completely fallen off the wagon only one month in? Resolutions aren’t easy. Often, we choose lofty goals that when not properly planned or attended to will crumble, causing you to fail. 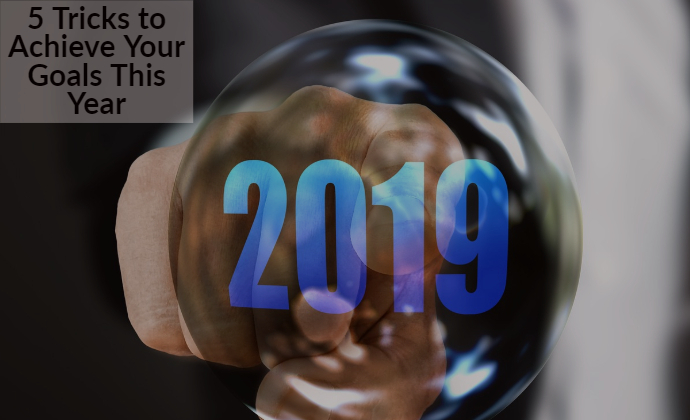 Choosing the right goal is one thing, but once you do, there are certain tips and tricks you can utilize to ensure your resolutions stick in 2019! This is by no means a new concept. We’ve all heard it time and time again, but just as a reminder, write your resolutions down and make them a part of your daily routine! Whether you write them on your bathroom mirror to read while you brush your teeth or you print them out to display in your office, you will be more likely to reach your goals if you make them a part of your everyday life. Most importantly, make sure you’re specific. When you write down vague statements, you’ll be more likely to make exceptions and excuses on a regular basis as to why you’re not hitting the mark. Specificity means clarity! Yearlong resolutions may work for some, but I know that I personally respond better and am more consistent with short-term goals (and I do NOT think I’m alone in that). Take your yearlong resolutions and break them into smaller chunks! Whether into weekly, monthly or quarterly goals, taking smaller steps to achieve your resolutions will help keep you on track. Just take it one step at a time. How often are you checking in with yourself about the status of your resolutions? We all know that life tends to get in the way from time to time, but by checking in with yourself on a regular basis, you’re able to monitor your progress. I find that jotting down my weekly challenges and thinking on ways to improve upon them helps me refocus and ignite the motivation I need to stay on track. I am a firm believer in accountability. Tell someone about your goals: your spouse or significant other, your sibling, your best friend, your grandma or even your dog – I don’t care who you tell – just let someone you know and trust in on your plans for success. Ask them to check in with you on a regular basis to help keep you focused (which may be a little difficult if you choose to tell your dog!). The truth of the matter is, we are our own worst critics. As you’re taking action to reach your goals, you will run into moments of weakness. Those moments of weakness don’t define your ability to succeed. Remember this! Remind yourself every day that you are human, and there will be times you’ll fall off the rails. Had a bad day? Week? Month? Brush it off, reflect, refocus and charge forward in the pursuit of your resolutions. Relax, you’ve got this! These are a just a few of the tips that I have found work for me when keeping or working toward my New Year’s resolutions. If you have any other tips or tricks, please share in the comments or feel free to use this as the place to write down your resolutions.